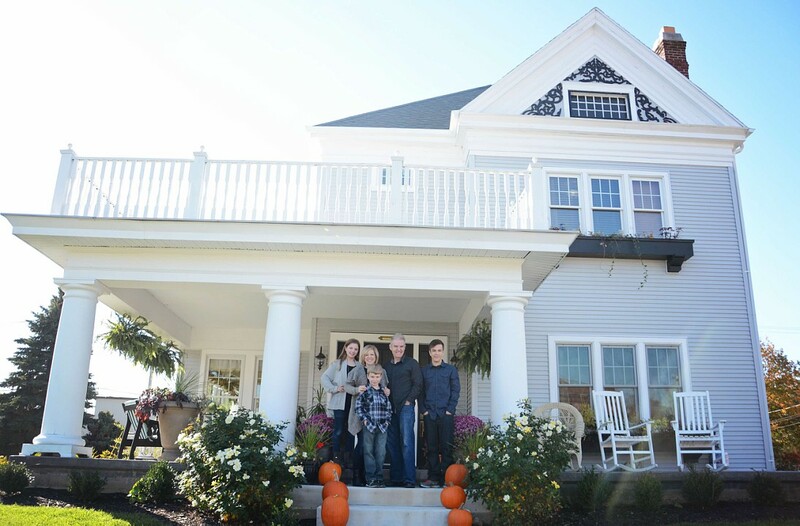 When we bought our old house, my favorite part was the big front porch, and the windowboxes on the front windows. Of course, like everything else, the windowboxes were rotted through and had to be thrown away. 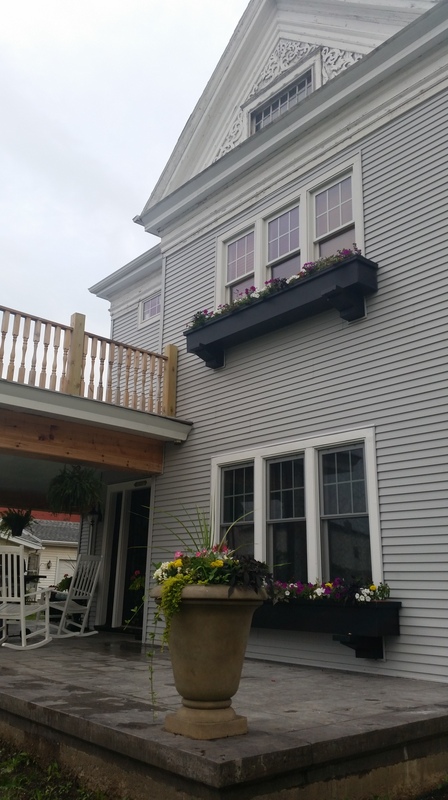 This summer I built new windowboxes – they are nearly 10 feet long and very heavy. 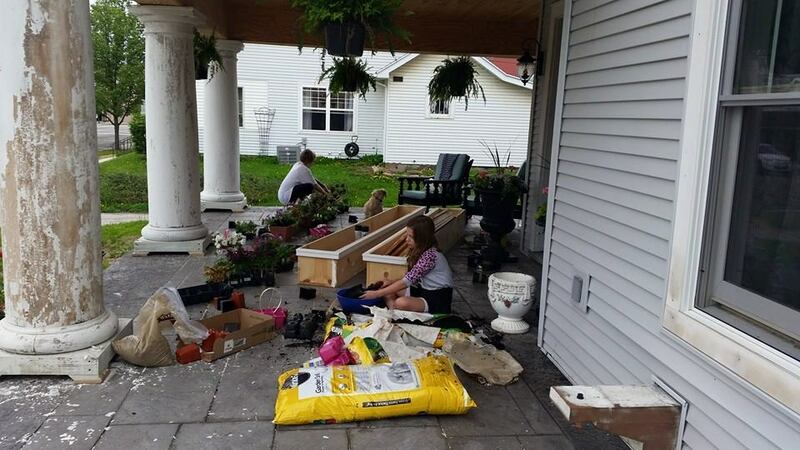 Over Mother’s Day weekend my oldest daughter and I planted tons of flowers in the windowboxes, and the other planters on the front porch. 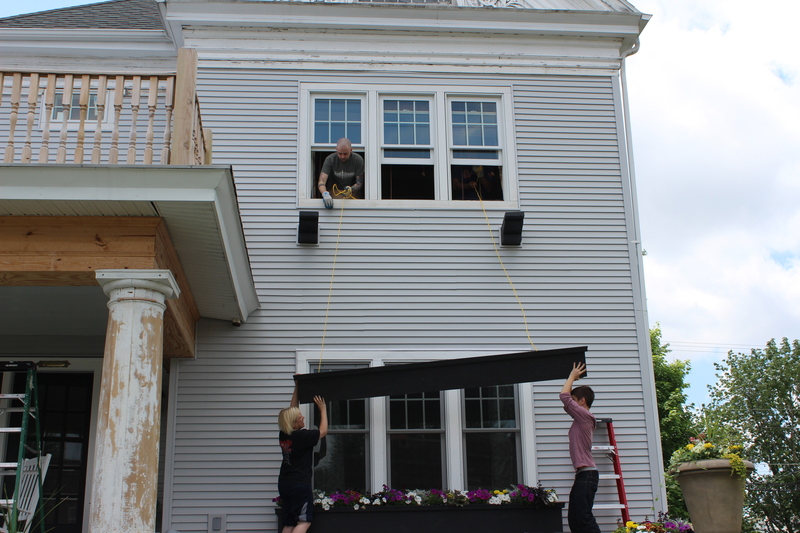 The huge windowboxes are insanely heavy, but getting the bottom windowbox up was no problem. However, the second floor windowbox posed a slight problem. At nearly 10 feet long, there was no was it would make it up the interior stairs, and around the corner to the master bedroom. That meant it need to be installed from the outside. 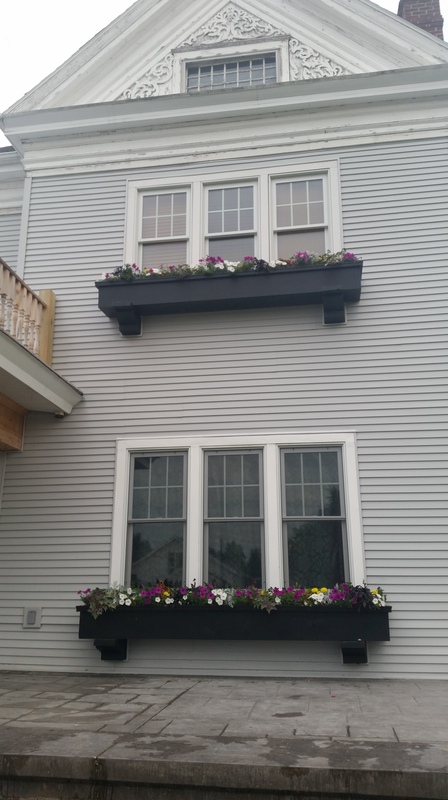 Many plans were put forward and rejected, leading my husband to name them “the windowboxes of doom” since he was convinced someone was going to get killed getting the second floor windowbox installed. 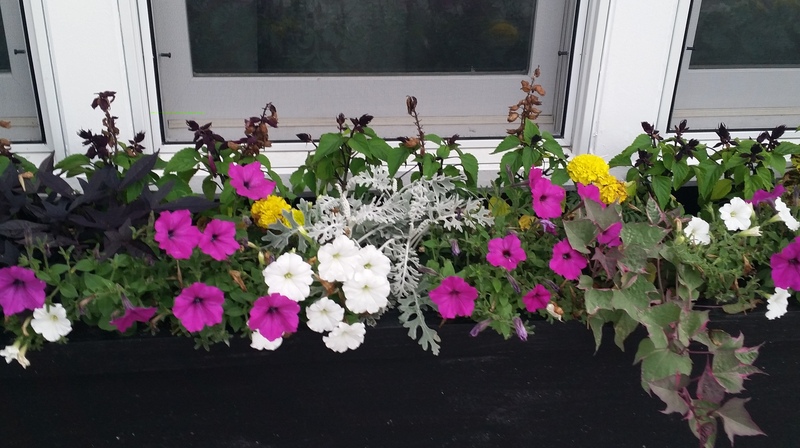 I finally decided that when my oldest daughter and son-in-law visited for Turtle Days that we would all work together to get the windowbox installed. Be careful if you visit me, because there is a very good chance you will be put to work! 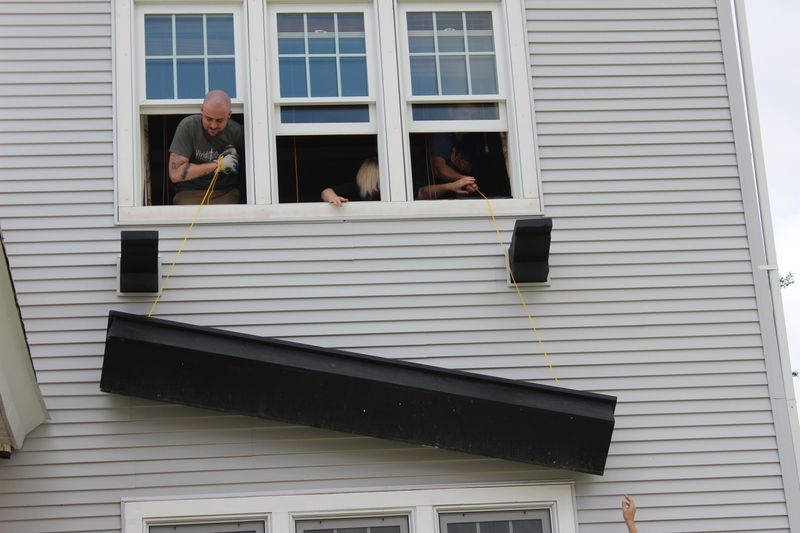 The plan I decided on was to tie rope around two sections of the windowbox and have my husband and son-in-law hanging out the upstairs windows pulling the rope. My 15 year old son and I would lift the windowbox up as high as we could, the men above would start pulling it up, and I would run upstairs and take my place in the middle window and guide the windowbox into place. This was slightly tricky as the supports really got in the way, and pulling a large, extremely heavy object straight up with a small rope, is a whole lot harder than it looks. Even my hugely pregnant daughter was put to work, taking pictures. I figured either the pictures would be used for this blog, or to show the surgeon who was trying to put one of us back together. My plan did work, although for a few tense seconds, it did seem possible that the entire windowbox would go crashing onto the ground. Luckily, my son-in-law is a lot stronger than he looks and manhandled the thing up and into place. 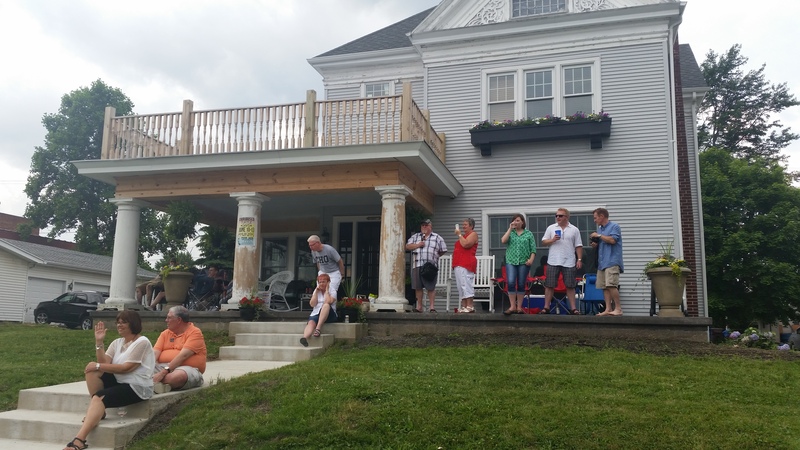 The good news is that the windowbox was in place for the Turtle Days parade that went right by the house! 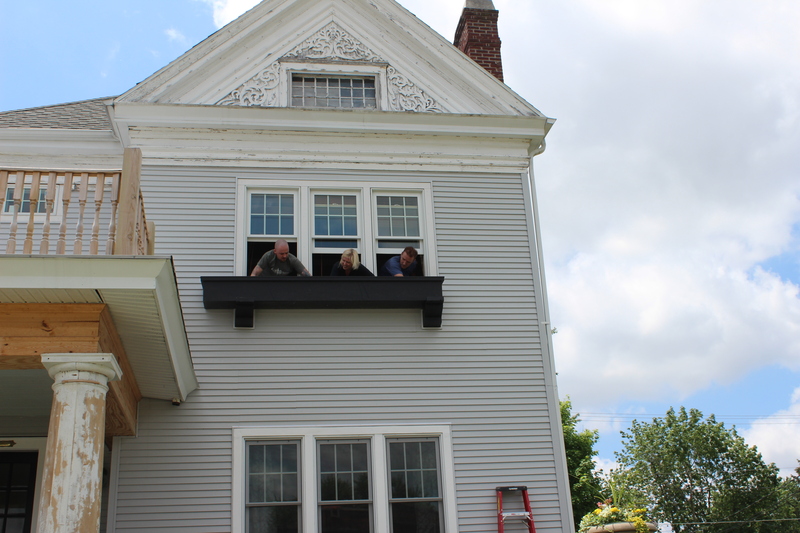 Now I just need to get the shutters made…..
We’re on This Old House!